In 1903, a St. Louis institution was born. The Missouri Athletic Club (MAC) has endured and thrived by remaining committed to being a premier athletic, social, and dining club for business, professional, and civic leaders, and families in the St. Louis area. Today, the MAC is recognized as one of the top private clubs in the United States. 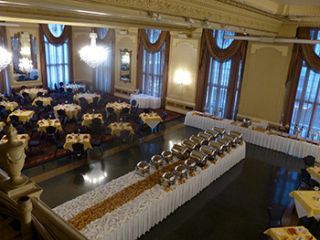 The Missouri Room was installed with ten Yamaha IF2208W loudspeakers that were custom painted to match the room. As part of the new system, TSI-Global installed ten Yamaha IF2208W loudspeakers that were custom painted to match the room. The speakers are processed using the new Yamaha CIS (Commercial Installation Solution) MTX3. TSI installed four DCP1v4S units to control six audio sources (three wall plate inputs, two Sennheiser wireless microphones, and a DVD player). “Two controllers are on the first floor and two controllers are in the balcony with duplicate controls so that the volume of any source can be controlled either upstairs or downstairs,” said Keller.